Preheat oven to 170C/ Gas Mark 3. Mix thyme, pepper and salt in a bowl. Place 1 tablespoon of oil in an ovenproof roasting dish along with the beef. Season beef with mixture. Cover with aluminium foil and place in oven for 90 minutes. As the beef cooks, add the potatoes to large pot with cold water. Cover and bring to the boil. Once boiling, simmer for 10 - 12 minutes until tender. Place the vegetables in a large pot and cover with cold water; bring to boil and reduced heat to simmer for 10 - 15 minutes until soft. Drain water from potatoes. Place 1 tablespoon of rapeseed oil in ovenproof dish and add in potatoes. Drizzle oil on top of potatoes, season and put in oven for 45 -- 55 minutes. For gravy, melt the butter in a pan over a medium heat. Stir in the flour. Slowly add in beef stock continue to stir to make a creamy gravy. Keep stirring until it becomes thick in consistency. Drain the vegetables and mash together. 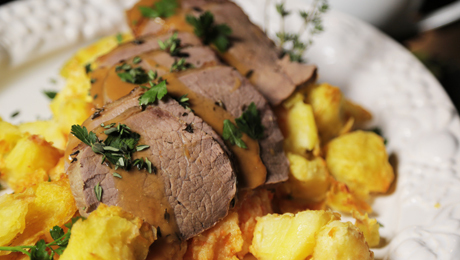 Remove potatoes from oven and serve with beef on side. Serve gravy on the side.